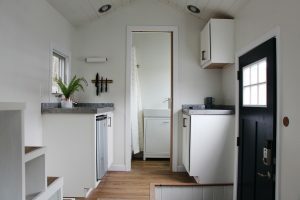 Quality and Craftsmanship Drive B&B Micro Manufacturing As One Of The Most Experienced Tiny House Builders In The World. At B&B Micro Manufacturing, quality and craftsmanship have always been our top priorities. 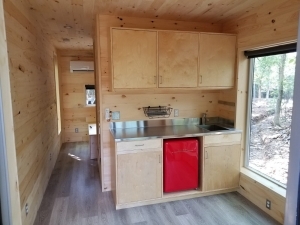 Using the highest quality materials and always striving to exceed industry standards for safety and building integrity has allowed us to grow into one of the most trusted and experienced tiny house builders in the entire world. 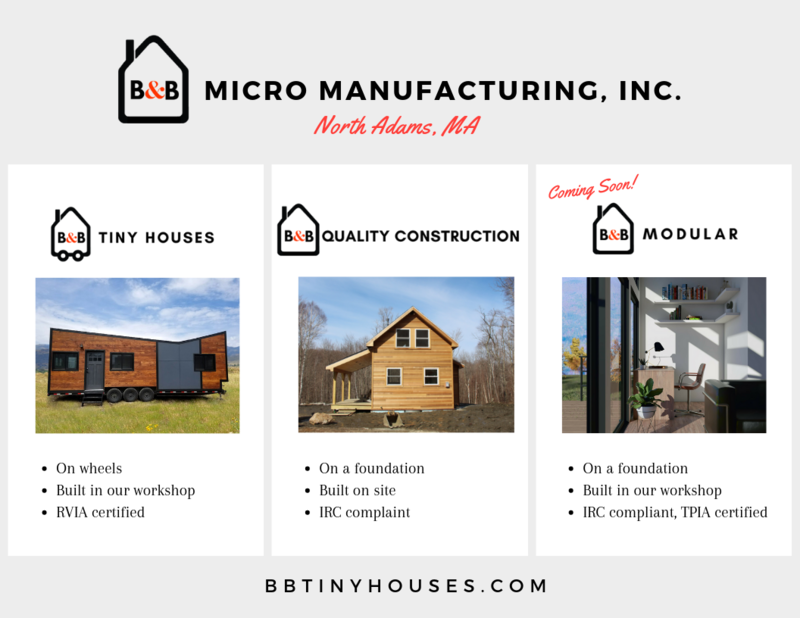 B&B Micro Manufacturing began in 2016 as a modest tiny house builder. Originally just a small project between the three partners, we have since grown to 42 employees who produce 10 to 15 RVIA-certified tiny houses a month in the beautiful Berkshires. We are thrilled to call North Adams, MA home, and to source the vast majority of our supplies locally. B&B has made its name on an unwavering attention to detail and quality. We have put together an impressively talented team of tradesmen and women who believe in only building the best product possible. We have our team to thank for our impressive growth, and through further outreach we will continue to expand nationally. We love tiny houses and are proud to be at the forefront of a long-lasting tradition of tiny house building. We believe our buildings are the future of affordable housing, and an attractive substitute to mobile living. We can build any small structure, build it well, and ship it to wherever needed. Please feel free to get in touch to speak to us about your project or housing goals. Prefab & Custom Built RVIA Certified Tiny Houses Are Safe and Ready For The Road. Did you know that a tiny house on wheels is considered an RV or “recreational vehicle” by transportation agencies (like DMV or RMV) in the United States? Tiny houses on wheels are held to the same set of building and safety standards as their camper cousins. As a Recreational Vehicle Industry Association (RVIA) Certified Builder, B&B Manufacturing is able to deliver road-safe tiny houses on trailers with their very own certificate of origin, backed by the RVIA seal. Have peace of mind knowing that your tiny house (or shell) was built by experts who keep up with the industry’s highest standards. Whether You Have Ideas Scribbled On A Napkin Or A Full Design Blueprint, We Can Make Your Vision A Reality. 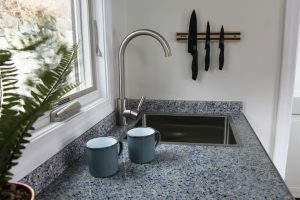 Whether you’re looking for a full-time, permanently-affixed primary residence or a vacation cottage on wheels, B&B Micro Manufacturing has the product for you. With options like bare bones frames on trailers, weather tight shells, or completely custom designed and built tiny and small houses on wheels and foundations, we can take on projects of many different kinds and see them through to completion. Trust our experience as expert tiny house builders to deliver a solution that fits your budget and exceeds your expectations. 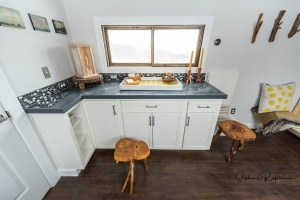 Enjoy Working With Experts Who Are Passionately Immersed In Tiny House Construction. Tiny house builders are different than regular construction companies. 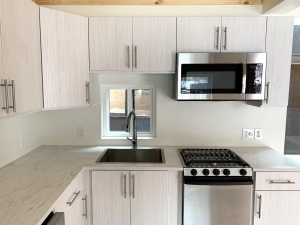 Building small, mobile and livable spaces requires a deep understanding of the tiny house lifestyle and a precise attention to fine details that are often overlooked in “big” construction. Benefit from working with builders who are passionate about tiny houses and completely immersed in the lifestyle. Ready For A Free Consultation With An Experienced Tiny House Builder?